Christmas Town U.S.A. is officially aglow for the Season! Roughly 200 people gathered at the Pharr Family YMCA in McAdenville for the 18th annual Tree Lighting Ceremony on November 30th. 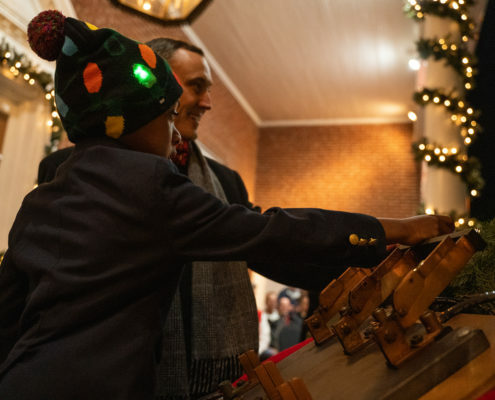 Lucas Singleton, a McAdenville Elementary student, pulled the ceremonial switch to flip on more than 500,000 red, green and white lights that adorn the town’s trees! The Tree Lighting Celebration kicked off the 63rd annual Christmas Town U.S.A. Festivities that started back in 1956. More than half a million people are expected to drive and walk through the 1.5-mile town to enjoy the lights this year, which will be shining every night until December 26th. Before the lights were switched on, Kindergarten-2nd Grade students from McAdenville Elementary sang holiday songs and town leaders addressed the crowd. Several local law enforcement departments will patrol and direct traffic in Christmas Town U.S.A. this December. CaroMont Health sponsored the Tree Lighting Ceremony. CaroMont CEO, Chris Peek told the crowd that he’s been coming to see the lights each year since his family moved here when he was 10 years old. Learn more about Christmas Town U.S.A. here.